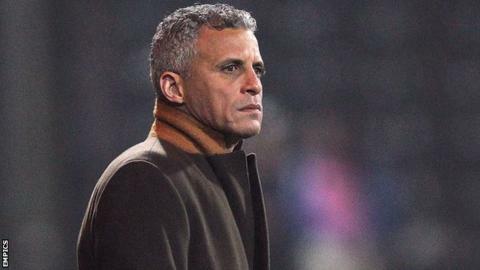 Notts County have announced that manager Keith Curle has been relieved of his duties with immediate effect, after less than a year in charge. The 49-year-old leaves Meadow Lane with the Magpies 10th in League One and five points from a play-off position. and have won just two of their last 11 matches in all competitions. First-team coaches Colin Lee and Colin West have also left the club. "This obviously is not a decision that we have taken lightly and certainly not one that I have taken any pleasure in reaching," chairman Ray Trew told the club website. "I have a tremendous amount of respect for Keith Curle both as a man and a manager. "Since Keith first came in, we have backed him to bring in the players that he felt could move Notts County on to the next level and felt that he assembled a squad capable of challenging for promotion this season. "However, recent displays have unfortunately not lived up to expectations and our poor disciplinary record this season has only further hampered our progress. "Attendances at Meadow Lane have dropped in recent weeks and this has made this a business decision as much as a footballing one, because fans are obviously key to the club and their support is essential." Former Manchester City, Wolves and England defender Curle was and won 23 of his 51 games in charge. His side missed out on a play-off spot on goal difference last season and they made a flying start to the 2012-13 campaign, only to see their progress halted by a stuttering recent run. on 26 January ended Curle's remarkable 22-game unbeaten away record as County boss. The Magpies are now looking for a seventh permanent manager since Ian MacParland left the club in October 2009. Hans Backe, Steve Cotterill, Craig Short, Paul Ince, Allen and Curle have all had stints in charge, while Dave Kevan has had two spells as caretaker boss.